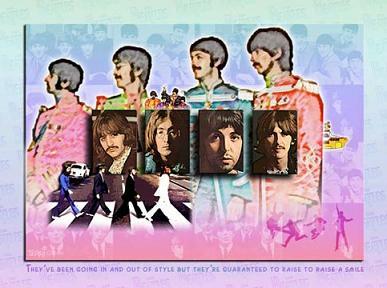 Yes, this is a graphic done with a photo of my set of bobbing head Beatles dolls that I won from KRLA over 50 years ago. Today is the Anniversary of The Beatles' first arrival on American shores, marking the anniversary of The Beatles first appearance on The Ed Sullivan Show on February 9th, 1964. On that night 73 Million people (make that teens and weary parents) watched their performance, making it one of the most watched television shows in history in those days. I was one of those teenagers, well, actually closer to a teeny-bopper as I'd just entered my teens. But I caught Beatlemania that night and have never found the cure. 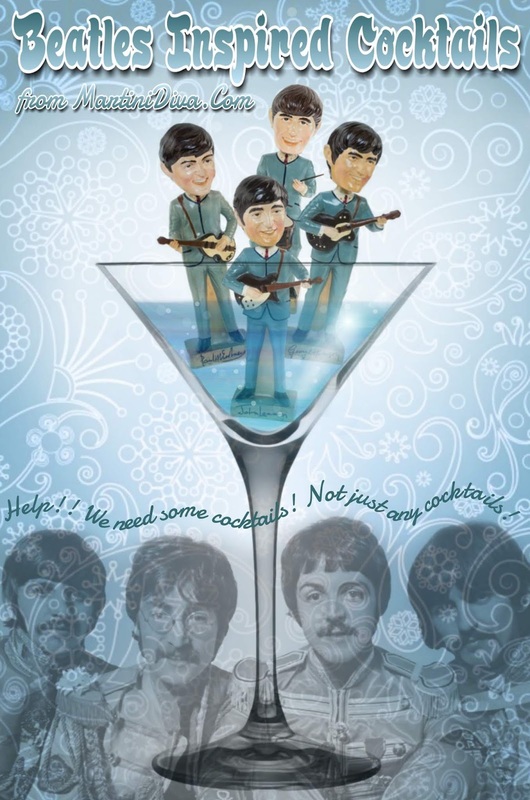 To honor my favorite band ever I have created some cocktails inspired by The Beatles. 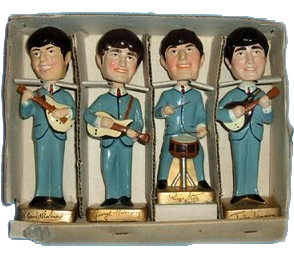 BEATLES ALEXANDER aka The Lennon Milkshake (John drank Brandy Alexanders all the time but called them milkshakes!) 1 Oz. Brandy 1 Oz. Godiva Chocolate Liqueur 1 Oz. Half & Half Add all ingredients to a cocktail shaker filled with ice and shake until well blended and chilled. Pour into a chilled martini glass and garnish with a dash of nutmeg and some dark chocolate shavings. THE SGT. PEPPER 1-1.2 Oz. Bourbon 2 Oz. Dr. Pepper 1/2 Oz. Lemon Juice Dash of Cherry Bitters Fill a cocktail glass with ice, pour in the bourbon, then add the lemon juice, the Dr. Pepper and tap a drop or two of Cherry Bitters on top. Garnish with a homemade Bourbon Cherry. LENNON DROP 1 Oz. Citrus Vodka Juice of 1/2 Lemon 1 Tablespoon Lemon Infused Sugar Zest the lemon and mix this zest into 1/2 cup of sugar. Set on a cookie sheet to infuse and dry for at least an hour. After your sugar is ready dip the rim of your glass into some lemon juice then into the lemon sugar and chill glass in the freezer. Next, fill a cocktail shaker with ice, add the vodka, lemon juice and a tablespoon of lemon sugar to the shaker and shake until the sugar has dissolved. Pour into a chilled martini glass, garnish with a twist of lemon. STRAWBERRY FIELDS COCKTAIL 1 Oz. Strawberry Vodka 1 Oz. Whipped Cream Vodka Whipped Cream Slice of Fresh Strawberry Pour the strawberry vodka into a shooter, add the whipped cream vodka. Top off with a shot of whipped cream and a strawberry slice. YELLOW SUBMARTINI 3/4 Oz. Dark Rum 1/4 Oz. Apricot Brandy 1/4 Oz. Banana Liqueur 1/4 Oz. Galliano 1 Oz. Pineapple Juice Juice of 1/4 Lemon Combine all the ingredients in a cocktail shaker filled with ice. Shake until well chilled. Strain into a chilled martini glass and garnish with a banana slice and one dried apricot. HAPPINESS IS A WARM GIN 1-1/4 oz London Dry Gin 3/4 Oz. Fresh Lemon Juice 2 Oz. Boiling Water 1 Tablespoon Lavender Honey 2 Sprigs Fresh Lavender Add the lemon juice, one sprig of fresh lavender and the honey to a fun Beatles Mug and muddle. Add the gin, then pour in the hot water. Garnish with the 2nd sprig of lavender. MAXWELL'S SILVER SHOOTER 1 Oz. Silver (aka Blanco) Blue Agave Tequila 1/2 Oz. Cointreau 1/4 Oz. Lime Juice Pinch of Smoked Sea Salt Pour the tequila, Cointreau and lime juice into a fun Gun Shaped Shot Glass then sprinkle on the smoked sea salt and serve. If you want to have a nice gun smoke effect, add a small piece of dry ice to the shot just before serving BUT warn your guests not to drink until the dry ice has dissolved. ELEANOR RUMBY 1 Oz. Dark Rum 1 Oz. Spiced Rum 2 Oz. Coconut Milk 2 Tablespoons Coconut Cream 1/2 Tsp. Mild Curry Powder Add a cup of ice to a blender. Pour in the rums, coconut milk, coconut cream and the curry powder. Blend until smooth and creamy then pour into a fun Beatles Glass and garnish with a sprig of fresh basil leaves. HARD DAY'S NIGHTCAP 1/2 Oz. Coffee Liqueur 1Oz. Chocolate Liqueur 1/2 Oz. Irish Cream 3 Oz. Warm Milk Dash of Cinnamon & Nutmeg Combine the liqueurs and the warm milk in a brandy snifter, sprinkle on the cinnamon and nutmeg and serve. You Love, Love Me Do now doncha? Let the Twisting and Shouting Commence! I am the Walrus!